Instead of electric motors, would you be okay with AMG exhaust notes and 750 horsepower? We’re approaching that awkward age with the automobile where more complicated technology that hasn’t been fully fleshed out yet will find its way onto our modern cars and cause both automakers and drivers headaches. Think electric vehicle technology and driver aids that do their best impression of fully autonomous systems but can’t quite pull off the feat just yet. As an automaker with its eye on being part of the future, Aston Martin is is susceptible to those downfalls, especially given that its R&D budget pales compared to those of larger automakers. Thankfully Autobild, citing a report from Wales Online, is reporting that the British luxury carmaker will put a pause on a fully electric version of the DBX SUV, which is what the model will eventually become, and wait until it refines the technology a bit more. When it is released in 2019, the DBX will come with conventional gasoline-fed power plants. 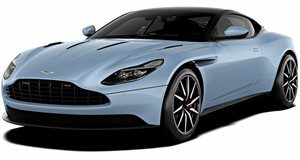 Possible options Aston Martin could (and should) choose from include the 4.0-liter AMG-built V8 that’s used in the the DB11 where it makes 503 horsepower and 513 lb-ft of torque. Snobs that scoff at anything with less than twelve holes in their blocks who are not swayed by AMG’s epic engine might drop extra coin to get behind the wheel of Aston Martin’s own 5.2-liter twin-turbo V12. In the DB11 it makes a brutal 600 horsepower and 516 lb-ft of torque, though Auto Bild postulates that power figures could increase with subsequent models that serve as intermediaries between the gasoline and all-electric powertrains. We’re talking, of course, about a hybrid DBX, which might not as fun until you consider the endless possibilities afforded by 600-750 horsepower of useable performance. After the hybrid models are out and Aston has had time to refine the electric powertrains, the EV models will follow. One futuristic touch that’ll be preserved from the concept are the cameras that are used in place of side mirrors. While Aston Martin continues to prepare its Wales production facility for the DBX, you just focus on scrounging up the loose change because this SUV will likely not cost a dime under $226,800 with higher trim models going as high as $300,000.